Alexandra Fuller was born in England in 1969. In 1972 she moved with her family to a farm in Rhodesia. After that country’s civil war in 1981, the Fullers moved first to Malawi, then to Zambia. Fuller received a B.A. from Acadia University in Nova Scotia, Canada. In 1994, she moved to Wyoming, where she still lives. She has two children. Random House Trade Paperbacks. PAPERBACK. B000PCBP48 Very Good Condition. Has some wear. Five star seller - Ships Quickly - Buy with confidence! . Very Good. Random House Trade Paperbacks. PAPERBACK. B000PCBP48 Meets or exceeds the good condition guidelines. Nice copy. Gift inscription inside cover. Five star seller - Ships Quickly - Buy with confidence! . Good. 2003-02-05. New. Ships with Tracking Number! INTERNATIONAL WORLDWIDE Shipping available. Buy with confidence, excellent customer service! Alexandra Fuller. Hardcover. 0753198606 New Condition. . New. Alexandra Fuller. Hardcover. 0753198606 Like New Condition. . Fine. New York: Random House, 2001. First edition. Hardcover. Very Good +/very good +. Inscribed by author on half-title page, "To Kriss- With best wishes, Alexandra Fuller." An excellent copy with no apparent flaws. First RH edition, number line "24689753" is correct for first printing with stated 1st edition. Unclipped DJ protected with new mylar cover. 8vo, bookseller #003567. Random House Trade Paperbacks. PAPERBACK. B00RKQ5HWI Like New. Clean, Tight and Neat. Five star seller - Buy with confidence! . Fine. London: Picador. Hardcover. 0330490230 New Condition. . New. Random House. Hardcover. 0375507507 New Condition. . New. Random House Trade Paperbacks. PAPERBACK. 0375758992 New Condition. . New. PICADOR. PAPERBACK. 144727508X New Condition. . New. Center Point Pub. LIBRARY BINDING. 1611731127 Former Library Copy in Excellent Condition. . Very Good. 2003-02-05. Good. Ships with Tracking Number! INTERNATIONAL WORLDWIDE Shipping available. May not contain Access Codes or Supplements. May be ex-library. Shipping & Handling by region. Buy with confidence, excellent customer service! Random House Trade Paperbacks. PAPERBACK. B00RKQ5HWI Very Good Condition. Five star seller - Buy with confidence! . Very Good. Random House Trade Paperbacks. PAPERBACK. B00RKQ5HWI Very Good Condition. Tight and Neat. Five star seller - Buy with confidence! . Very Good. Random House Trade Paperbacks. PAPERBACK. B00RKQ5HWI Very Good Condition. Has some wear. Five star seller - Buy with confidence! . Very Good. Random House Trade Paperbacks. Paperback. 0375758992 . Very Good. 2003. London: Picador. Hardcover. 0330490230 Prior ownr name to flyleaf. 1st printing. An unread book. . New. 2002. 1st Edition. RANDOM HOUSE. New. 7.44 x 6.68 cm. Demco Media, 2004-08-30. Paperback. Very Good. Random House, 2001-12-18. Hardcover. Used:Good. Berkeley: U. of California. Near Fine/Near Fine. 1997. 1st. hardcover. 8vo . 263pp . Random House. Hardcover. 0375507507 Like New Condition. . Fine. London: Picador. Hardcover. 0330490230 Like New Condition. . Fine. Random House Trade Paperbacks. PAPERBACK. 0375758992 Like New Condition. . Fine. PICADOR. PAPERBACK. 144727508X Like New Condition. . Fine. Random House. Hardcover. 0375507507 . New. Picador. Used - Very Good. Ships from the UK. Former Library book. Great condition for a used book! Minimal wear. 100% Money Back Guarantee. Your purchase also supports literacy charities. 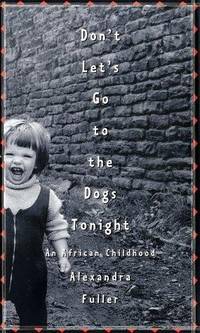 DON'T LET'S GO TO THE DOGS TONIGHT: An African Childhood. New York:: Random House,, (2002.). Fine in illustrated wrappers (a new copy.). Advance Reading Copy (trade paperback format. ) "A book about growing up white in rural Africa...a child's experience in a brawling bad-luck family on the losing side of an anti-colonial war." (William Finnegan) Set in Rhodesia and Zambia. Sometimes poignant, sometimes humorous, this is always interesting. Recommended. 255 pp. Demco Media. Paperback. POOR. Noticeably used book. Heavy wear to cover. Pages contain marginal notes, underlining, and or highlighting. Possible ex library copy, with all the markings/stickers of that library. Accessories such as CD, codes, toys, and dust jackets may not be included. New York: Random House, 2002. Stated first edition. Unmarked copy with one page corner creased. 301pp. Dust jacket in a new mylar cover.. First Edition. Hardcover. Very Good/Very Good. 8vo - 8" - 9" Tall.